Antonia Rolls is at home. In fact, she's in bed. 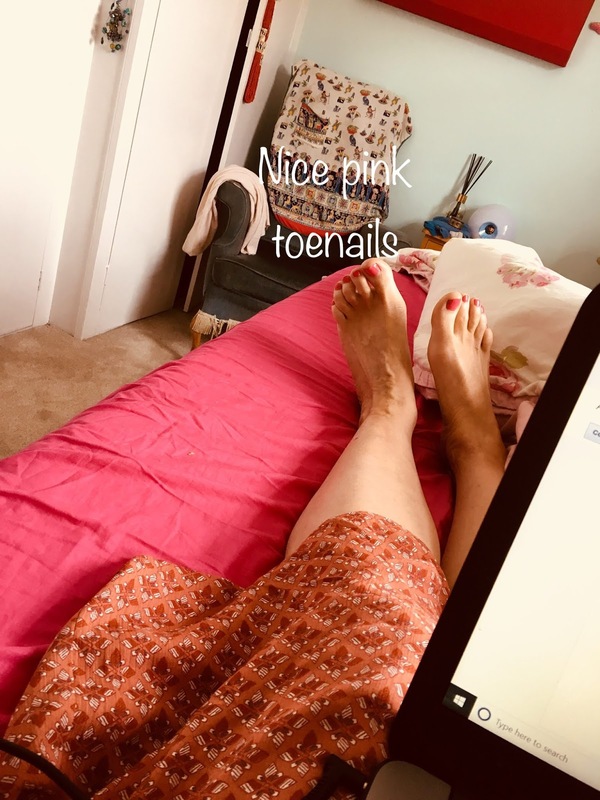 I had a lovely bath at about eleven this morning, painted my toenails pink, got dressed and got back into bed. 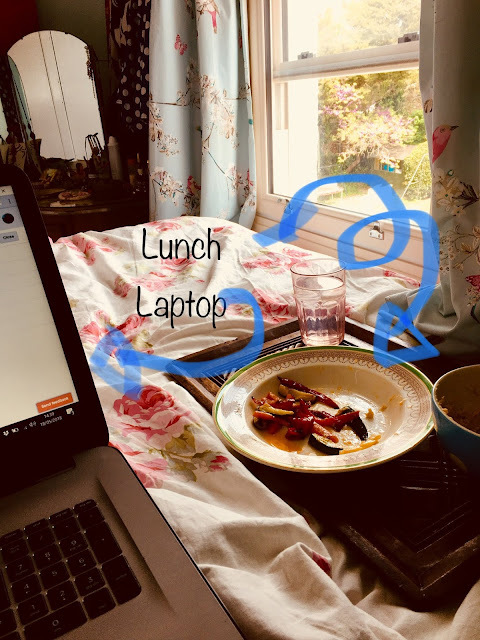 I am in bed now, writing this; beside me is my lunch and outside my window is the neighbour's garden looking splendid in the sunshine. I have an appointment at four today and can't go in my pyjamas, so getting dressed and back into bed seemed a good plan, I am in bed working like a good person, but I am dressed ready to go when I need to and I have lunch on a tray to sustain me. The idea of home, home coming, home sickness and being home is something I am working on at the moment. It has taken a long time to understand how lost I have felt and to articulate it. I had spent eight years spending time alongside people at the end of life as a soul midwife, but nothing prepared me for the losses, one after the other, of my mother, brother and husband in 2015 and 2016. I took a year off in 2017 to hide, rest and recover. That time off was as hard as any other time - we do not simply sit down and become rested and recovered within half an hour. Sitting down, taking time off and away, knowing that we are struggling with life is a courageous move as we know that once we stop moving and being distracted, all those little demons in our heads come out to play. It takes focus to recover. We come to terms with such feelings as loss, regret, guilt, anger, resentment. There is love and light and laughter too, but when we are struggling and when we are suffering, love light and laughter belong in another universe. Taking time off to recover takes a long, long time. We face a lot of things, we understand a lot of things and when we feel stronger, we are glad that we did it. But we don't want to do it again if we can help it, not for a while at least. I felt that during my year off that I was struggling to come home. To come back to myself, to find myself again in all this disruption. I imagined myself wandering off on my own, into some kind of shadow lands, and losing myself. The first thing to do was to recognise that I had left. I had left myself. I had left home. It was lonely out there, and I didn't belong. Having recognised that I had left home, left myself, I made a decision to return. In effect, I stopped walking, turned round and saw that not only had I come a long way off track, but that there was a way back and that I could take it. I made a decision to come home, back to myself. And now, coming back to myself, coming home, I needed to know who I was coming home to. Who was I? The business of finding myself again, coming back to myself and being grounded in myself felt like being home. I was understanding what it was to be home, in myself. This was a place from where I could stand in my own space, be grounded, feel strong. Life does not stand still. In my work as a soul midwife over the last ten years, I know that we have to make some adjustments at some point to accept that our lives will end. It is hard to do, but it is better to accept it than to live in fear and hope death goes away. It is a preparation to go home, to face our dying, to accept the final journey. 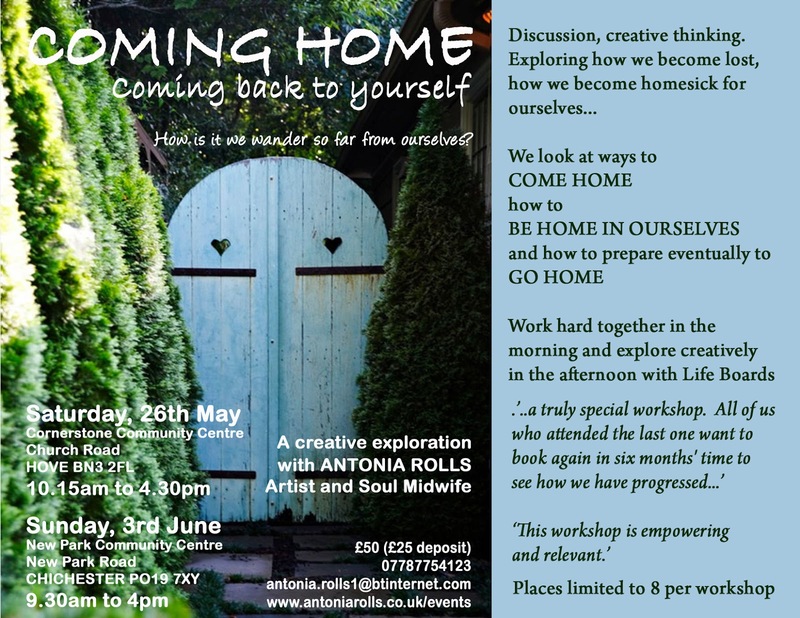 Everything that I have been thinking and experiencing while hiding away to recover, has come together to form the Coming Home workshops. The points I made above are the basis of the workshops. Recognising you have left home, left yourself. Loss of faith. Deciding to come home, back to yourself. Seeking faith. Preparation to go home, preparing for the final journey at the end of life. Using faith. For the purpose of this workshop, faith is faith in yourself. The subject of who we are and how we live our lives is constantly changing, constantly in motion. 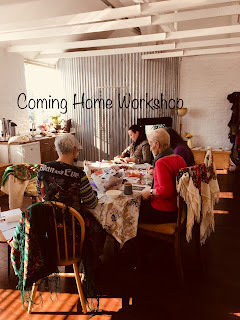 My life is endlessly moving back and forth, to and fro, and since I have begun holding these Coming Home workshops, I have learned how many ways there are to leave home, leave yourself and to come home, come back to yourself. I have a limit of eight people per workshop. The energy of a smaller group is supportive and kind, and there is much sharing as we spend the morning going through the four points above. Sometimes there are tears, sometimes laughter and always there is respect and support. We are all homesick for ourselves in different ways. The afternoons are spent creatively making Life Boards, which reflect back to you with uncanny accuracy, how you are feeling and who you say you are right now. By the end of the day long Coming Home workshop, some alchemy has changed many of our hearts and minds, and we know that we are going to be fine. Workshops are £50 per person. A £25 deposit will secure your place. Only eight places available per workshop. There is more information on my website at www.antoniarolls.co.uk/events. There will be more workshops coming up and I will post them on the website. Would you like to come? To book your place email antonia.rolls1@btinternet.com or you can call me on 07787754123. Coming Home, join us and gently take back your power. "Having been to one of Antonia's Coming Home workshops, I can sincerely recommend it. Antonia has such a caring, gentle way about her and offers some very insightful ways of looking at things that really make you think. I had a really lovely and helpful day. Thank you Antonia." "Antonia has a knack of making you feel special. The room we met in was draped (some literally) in her personal touches which transform a space. I personally enjoyed the day and it gave me room to think about where perhaps I want to move towards and what's important to me. I particularly liked a visualisation & getting sticky with collage and colour - the result sits next to my bed as a reminder of the Essence of Me (Don't stray too far from it Deb!). 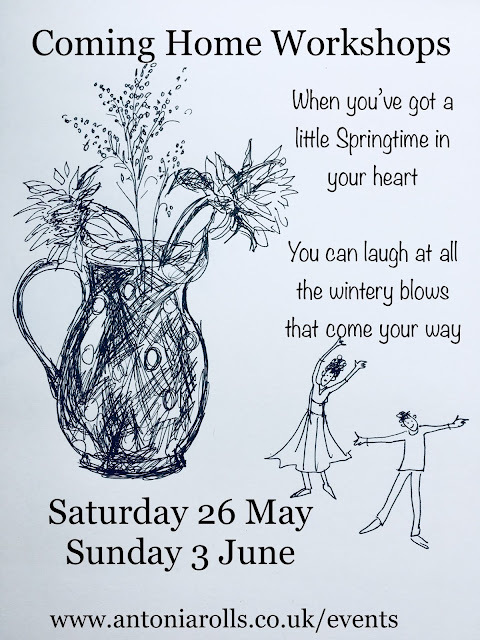 This time for me was a prodding, but, it was also a chance to see some other participants have a 'Life Change' moment, which was quite special. Thanks for the chance to have some gentle reflection & guidance, in a busy world."